It’s been almost exactly two years since I last did an in-depth review of any custom accessories, for a number of different reasons. I’ve been crazy busy with work (yes, TBB contributors all have “real” jobs), but more importantly none of the stuff from the accessory vendors has really excited me enough to highlight here myself. 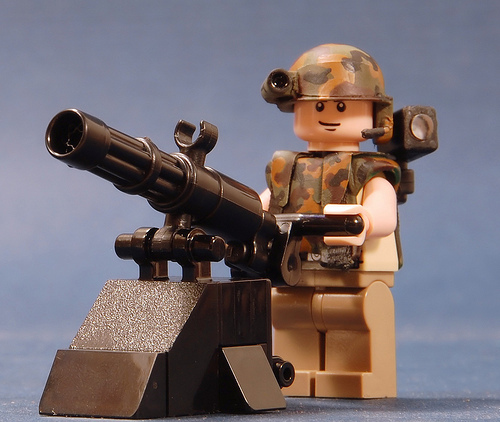 But I think the new Minigun from BrickArms is different enough and awesome enough for me to share my enthusiasm with all of you out there. 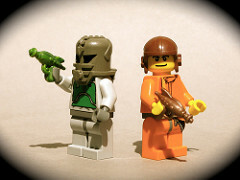 Will Chapman sent The Brothers Brick a batch of the new items, and I’ve been enjoying them ever since. I’m not currently set up for photography, so Catsy has kindly agreed to let me use his pictures for this review. Thanks! 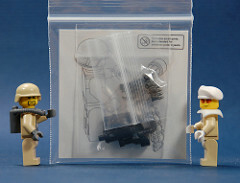 For all of Catsy’s review photos, see Flickr, and for his own review, see the BrickArms Forums. 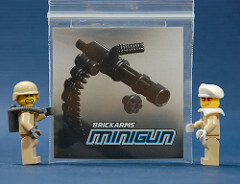 First, the Minigun is the most complex single item BrickArms has produced to date. The weapon itself consists of three separate parts, with a body, barrel, and handle. Each kit comes with both exposed barrels and shrouded barrels for the end of the gun, plus a “buildable ammo chain” — 14 different parts in total. For buyers used to BrickArms’ usual $1 for most items, this complexity should explain the $8 price tag. 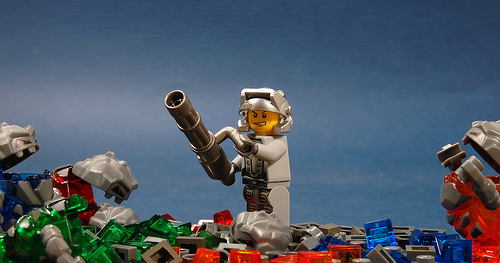 Second, the various holes, attach points, and modularity of the Minigun translate to a wide variety of ways to put it into action, including for vehicles and fixed defenses. Third, the Minigun’s modularity also translates to some interesting color combinations. It’s currently only available in black, but Will sent us about ten different colors to play with, as he did for Catsy, whose “overheated Minigun” below combines gunmetal, trans-red, and trans-orange. My own version hands the overheated brass Minigun to a Victorian gentleman in an oversized stovepipe hat, for an excellent steampunk effect. (Pics to follow at some point…) I’m looking forward to these other colors becoming available to everyone. Finally, BrickArms has released production versions of the Raygun and Tactical Sword, which have been in circulation as prototypes for quite a while. I highlighted the Raygun prototype a couple years ago, and the production version doesn’t disappoint — though minus the lovely swirl effect in the early prototypes you see in the photo (right). The Raygun and Tactical Sword are $1 each and are available in all 10 current colors. An important change to the way BrickArms is selling their products as of this month is that all sales go through resellers. Prices appear to be comparable to buying directly in the past, and products are now available in more countries. 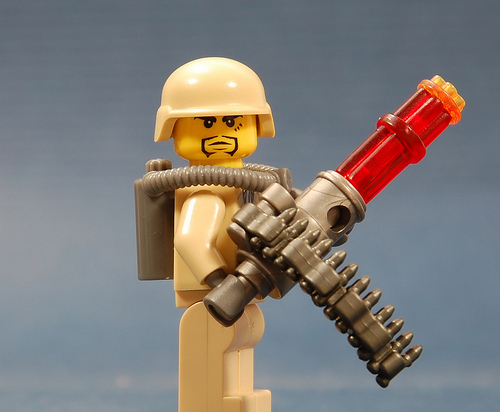 Officially due out June 1st, the Minigun, Raygun, and Tactical Sword are already available from most resellers now. Great! Now someone needs to build a Heavy.